On Saturday, many of the all-star seniors of the state of Florida will line up on the Holloway Park course. This race will mark the end of their high school cross country seasons for some, and others will use this race as a tune up before Footlocker and NXR next week. The central Florida girls are bringing in some teamwork for this race with a few of them on the same high school team. The fun about this race is that many of these girls compete head to head and on Saturday they will need to work together to pull off a win for the east side. Among the teammates are Lake Brantley duo: Chloe Hyde and Jordan Stevens. Hyde finished 10th at state in a time of 18:30 and Stevens finished 23rd while running consistently in the low 19 minute range this season. Magnolia Lake and Hayley Barrett, another duo out of Rockledge HS, will join Hyde and Stevens. Lake ran a PR of 18:56 to finish 15th in the FHSAA 2A state final and has taken her time from a 20:11 to an 18:56 over the course of the season. Barrett also ran a PR at state, running 19:24 to have a very strong progression throughout her season. Sophie Valenti, out of Lakeland HS, ran a 19:46 at state last week. Coming from Lakeland, Valenti, has a lot of experience on the Holloway park hills. She ran a 20:27 back in September at the flrunners.com Invitational. With her 19:46 improvement on the ARP course we can predict another sub 20 minute performance out of Valenti. Sasha WiecheckiVergara, out of Holy Trinity Academy, is another athlete that has had a lot of experience on the Holloway Park course this season. WiecheckiVergara has run a progression of 22:17, 21:12, and 20:35 on the Holloway Hills and coming off a 20:21 performance at state we could see her 20:35 time go down this weekend. Charis Ivey, out of Winter Park, and Juliet Small, out of Lake Highland, have yet to race the Holloway Park course this season, and they are ready to bring some speedy talent to the East girls team. Ivey ran a 20:16 at state. She has a PR of 20:04 at Great American. Her 20:16 is very impressive and could be an indicator of a sub 20:10 finish on the Holloway hills come Saturday. Small ran a 20:38 at state this past week and has been very consistent in the sub 20:30 range. The Lake Highland senior made it to the state meet as an individual after her 15th place 20:07 run at the 2A Region 2 meet. Like Ivey, Small is a great addition to this East squad with such persistent and steady performances. The East girls will be coached by all-star Rockledge coach, Peggy Sebetka. Coach Sebetka led her Rockledge girls to a regional runner-up team finish and a fifth place finish at the FHSAA 2A state finals this season. Just like the East girls team, the North girls have a few team pairs as well and it looks like they will bring the North Florida weather down to Lakeland with them. Niceville duo, Jayda Brooks and Hannah Farley, had very similar breakout seasons. Brooks took her time from 21:53 to 20:45 on the Apalachee Regional Park course this season and Farley took hers from 22:10 to 20:50. Both Brooks and Farley ran the flrunners.com Invitational on the Holloway park course and with their 20:40 -20:50 performances at state, we could for sure see another sub 21 minute performance out of these ladies. Pensacola Catholic is also sending two of their athletes with Brianna Wyer and Sheri Frymire scheduled to compete on Saturday. Wyer ran a time of 20:40 at state and has been running consistently in the 20:40-21:00 minute range all season. Frymire ran a 21:08 at state last week and has taken her performances down from a 23 minute season opener back in September. Both of these ladies have yet to run the Holloway Park course this season and just like Brooks and Farley, we could see two more sub 21 minute 5k performances. Leah Marville, out of Nature Coast Tech, has the fastest state time out of this group of girls, running a 20:25 on the ARP course last week. She has been in the mid to low 20:20 minute range throughout the season and along with Summer Williams, Sarah Dann, and Caroline Woolfolk could lead the the North girls. Williams, out of Florida high school, ran a 20:32 at state. We watched her win the Katie Caples varsity race in a 20:43 and since then she has brought her 5k time down and competed against some of the best in the state. Dann, out of Robinson HS, ran 20:26 at the state meet. She ran the Holloway Park course earlier this year and ran 21:18 in the heat. With her experience on the course, there is a strong chance we could see a sub 20:30 performance out of Dann come Saturday. Woolfolk, out of St. Augustine HS, had a breakout season going from 23 minutes down to 20:31 at state last week. She hasn't run Holloway and it will be fun to watch her race and hopefully add to her season by capturing another sub 21 performance. The North girls will be coached by all-star coach, Jamie LaFollette out of Niceville. Coach LaFollette led her Niceville girls team to a district championship win and a sixth place state finish. The South girls are coming to Lakeland with fire and excitement for the FACA show down. Some of these ladies were in very competitive regional races and missed out on the state championship, FACA will allow them to have the opportunity to race in great weather on fresh legs with speedy competition. Nicole Limperis, out of Cardinal Gibbons, and Camille Strackbein, out of Gulf Coast, missed out on the state meet. Limperis ran a 20:17 at her region and Strackbein ran 20:58 at hers. Both ladies have had strong progressions throughout the season and are looking for a breakout race to end their senior cross country careers. Emma McLaughlin, out of Tampa Bay HEAT, has the fastest state time of the group with her 19:56 run at state last week. McLaughlin ran a 21:53 at flrunners.com Invitational back in September, so it will be great to watch her run and break that 21 minute barrier on the Holloway hills. Nicohl Torres Santos, out of St. Thomas Aquinas HS, ran a 20:07 at the state meet and has been running consistently in the 20 minute range all season. She ran a 20:41 on the Holloway Park course back in September and has the fastest course time out of the group. Breanna Pina, out of Park Vista, started her season at 22:08 and has improved week by week. She ran a 21:29 at the flrunners.com Invitational and this past weekend ran 20:20 at state. Coral Springs', Yasmeen Hammad, has had a fantastic championship season, showing she can peak when it counts. Her district, regional, and state meets have all been sub 21 minutes with a PR of 20:23 at state. Will she add another sub 21 performance to her record? Valencia Powell and the Dillard HS girls have had one heck of a season. Powell ran a time of 20:33 at state last week and a 20:24 at region the week prior. With cool weather like last week and a similar level of difficulty when it comes to terrain, there is no telling what Powell is capable with fantastic conditions. It will be an exciting race to watch. The South girls will be coached by all-star coach, Dan Barry of Park Vista HS. Coach Barry led the Park Vista girls to a district runner-up finish this season. The West girls are looking like the favorite to win as a team this weekend. With three ladies sub 19:10 at the state meet and five ladies sub 20:15, they will be tough to beat. It will also be a close race with the East girls having some of the top times leading into the meet. Isabella Coogan, out of Port Charlotte, has the fastest state time out of this group, running 18:56 last week. She has run 19:15 on the Holloway Park course at the flrunners.com Invitational. Coogan will be up in that lead pack during the race with Chloe Hyde and Magnolia Lake. Cape Coral senior, Cheyenne Young, has had one heck of a breakout season. She ran a 19:01 at state. With a conference championship under her belt and a previous Holloway Park course time of 19:04 we could see Cheyenne in the top pack on Saturday. Cadi Rowe, out of Lake Minneola, will join Coogan and Young, as the top three for the West team. Rowe ran a time of 19:08 following her 18:41 region performance. She has not been on the Holloway Park course this season, but her 19:08 on the ARP course indicates her strength on the hills. She will be amongst the top pack as well. Recent Mississippi State commit, Savannah Schwab, ran a time of 20:07 at the state meet. Schwab ran a 20:13 at the flrunners.com Invite back in September. With her 1:00.38 400m and 2:18 800m speed, Schwab is not someone you want hanging on your shoulder towards the end of the race. Amanda Brake, out of Wharton HS, has had a very strong season, running 20:05 at the state meet last week. Brake has not run Holloway this season, but with a team where the majority of athletes have, she will be able to pack up and compete with her teammates around her. Palmetto Ridge senior, Mo Palmer, ran a 20:06 at the state meet and has a 19:54 Holloway Park course time. With the cooler weather, on a course she knows very well, we could see Palmer go sub 20 minutes yet again on the Holloway hills. Chablis Shreffler, out of Tavares, ran a 20:04 at the state meet to finish right ahead of her teammate Savannah Schwab. These two ladies could really work together during this race and help the West girls to the team win. Hannah Hoffman, out of Newsome HS, ran a 20:11 at the state meet to help lead her team to a third place finish. Hoffman ran a 20:49 on Holloway back in September and has had a very strong season since. The West girls will be coached by all-star coach, Anthony Triana out of Wharton HS. Coach Triana led the Wharton girls to a district runner-up finish this past season. 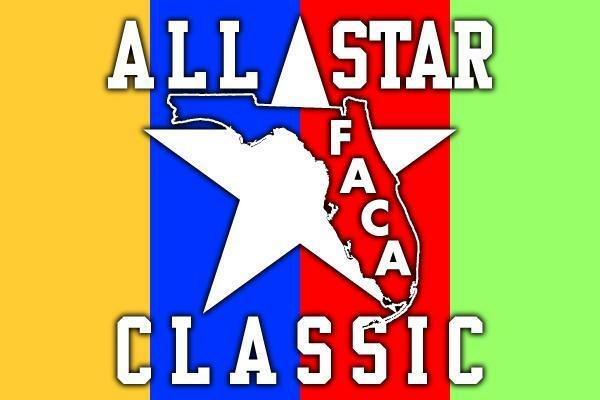 Follow us on twitter @flrunners to catch live updates and all the fun from the FACA All-Star Classic.